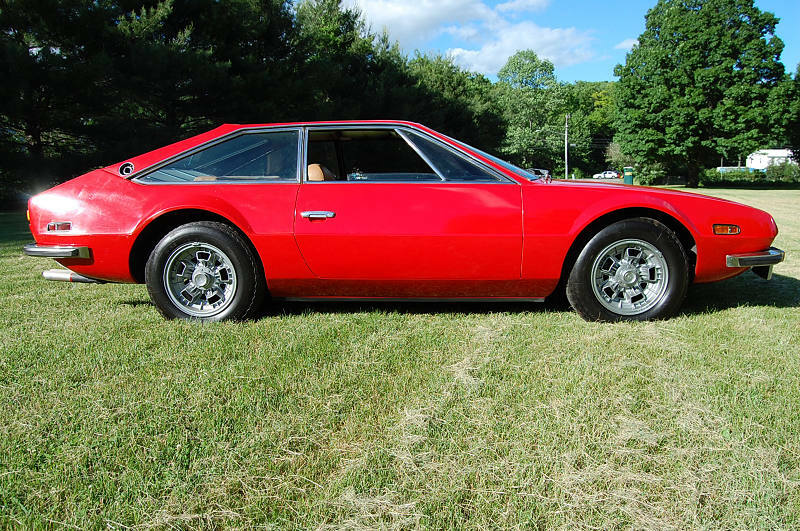 1971 Lamborghini Jarama, red with tan interior, only 27,937 miles. Numbers matching chassis and motor. Only 177 examples of the Jarama were produced between 1970 and 1973, which makes this a very rare car. The engine is a 4 liter V-12 fitted with six Weber carburetors that produces 350 horsepower at 7500 rpm. Combined with a 5 speed transmission, the Jarama drives fast and sounds great, with a top speed over 150 miles per hour. This early Jarama is the most desirable configuration sought by knowledgeable collectors because it was fitted with Miura-type knock off wheels, and a leather dash instead of the plastic dash found on later Jaramas. It was also fitted with the desirable fold- down rear seatbacks, which can convert the car into a 2 seater! This particular car was owned by the same family for almost 30 years, from 1983 until 2013.According to the Lamborghini Registry, this car was brought into the USA on March 3 1971, it is recorded by them as being the first Lamborghini Jarama sold in the USA, it was sold out of Lamborghini New York. The car comes with the original factory owners manual and parts book. the original factory jack, with wrench and socket for the jack, also an original wheel chock and lug nut wrench. There are also two original factory brochures which feature the Jarama. Once purchased a light recommissioning was done, including cleaning the carburetors, redoing the brakes, and installing a new exhaust center section. At the present time the car runs well, but it has not been driven a lot. Cosmetically here are the flaws- the paint has some cracking in it, and there is a mismatch of the paint detectable in the rockers where some minor rust was properly repaired by cutting it out and replacing it with new metal- now there is no rust on the car. The interior is very nice with soft leather. The correct gas cap is missing. And the windshield has a few small bubbles in the glass. Other than these flaws, this is a very nice example of a rare Lamborghini that with a little work to become an excellent example throughout.